Catch the Hottest Stars on the "Coolest" New Stage in SKATE DANCE DREAM! The Stars with the next generation of talent will be dancing into town for a one-time only performance on July 19, 2014 staged at the Carolina Ice Palace in Charleston at 7:00pm. 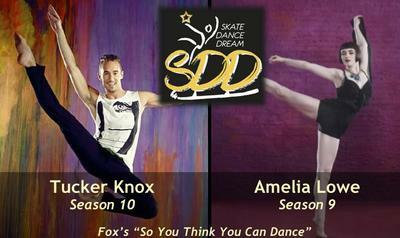 The Show will feature Top Finalists from Fox's hit show "So You Think You Can Dance" including Tucker Knox & Amelia Lowe, plus a cast of U.S. National figure skating medalists. Also performing will be the next generation of talent, local "Future Stars"-dancers and skaters from the surrounding areas who will have their dreams fulfilled sharing the spotlight with their heroes in the show.